Shea butter (/ˈʃiː/, /ˈʃiː.ə/, or /ˈʃeɪ/) is an off-white or ivory-colored fat extracted from the nut of the African shea tree (Vitellaria paradoxa). Shea butter is a triglyceride (fat) derived mainly from stearic acid and oleic acid. 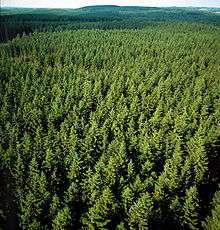 It is widely used in cosmetics as a moisturizer, salve or lotion. Shea butter is edible and is used in food preparation in Africa. Occasionally, the chocolate industry uses shea butter mixed with other oils as a substitute for cocoa butter, although the taste is noticeably different. The English word "shea" comes from s’í, the tree's name in the Bambara language of Mali. It is known by many local names, e.g., karité in the Wolof language of Senegal, ori in some parts of West Africa, and many others. Accounts from as early as Cleopatra's Egypt speak of caravans bearing clay jars of valuable shea butter for cosmetic use. The funeral beds of early kings were carved in the wood of shea trees. Shea butter's skin care and healing properties were first harnessed thousands of years ago. The history of shea as a precious commodity can be traced back to Ancient Egypt, where shea butter was and continues to be used to protect the hair and skin in the fierce sun and the hot dry winds of African deserts and savannah. 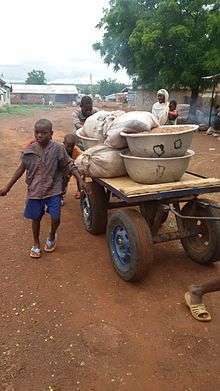 Child labourers transporting crushed Shea nuts, Jisonaayili. Separating/cracking: The outer pulp of the fruit is removed. When dry, the nut, which is the source of shea butter, must be separated from the outer shell. This is a social activity, traditionally done by women elders and girls who sit on the ground and break the shells with small rocks. Roasting: The crushed nuts are roasted in huge pots over open wood fires. The pots must be stirred constantly with wooden paddles so the butter does not burn. The butter is heavy and stirring it is hot, smoky work, done under the sun. This is where the slight smoky smell of traditional shea butter originates. 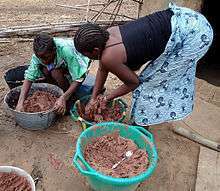 Grinding: The roasted shea nuts are ground into a smoother paste; water is gradually added and the paste is mixed well by hand. Separating the oils: The paste is kneaded by hand in large basins and water is gradually added to help separate out the butter oils. As they float to the top, the butter oils, which are in a curd state, are removed and excess water squeezed out. The butter oil curds are then melted in large open pots over slow fires. A period of slow boiling will evaporate any remaining water. Collecting and shape: The shea butter, which is creamy or golden yellow at this point, is ladled from the top of the pots and put in cool places to harden. Then it is formed into balls. Industrially, a mechanical sheller such as the universal nut sheller may be used. The refined butter may be extracted with chemicals such as hexane or by clay filtering. Shea butter extract is a complex fat that in addition to many nonsaponifiable components (substances that cannot be fully converted into soap by treatment with alkali) contains the following fatty acids: oleic acid (40-60%), stearic acid (20-50%), linoleic acid (3-11%), palmitic acid (2-9%), linolenic acid (<1%) and arachidic acid (<1%). Shea butter is mainly used in the cosmetics industry for skin- and hair-related products (lip gloss, skin moisturizer creams and emulsions, and hair conditioners for dry and brittle hair). It is also used by soap makers, typically in small amounts (5-7% of the oils in the recipe), because it has plenty of unsaponifiables, and higher amounts result in softer soaps that have less cleaning abilities. Some artisan soap makers use shea butter in amounts to 25% - with the EU regulating the maximum use around 28%, but it is rarely the case in commercially produced soap due to its high cost against oils like palm or pomace (olive). It is an excellent emollient for people who suffer dry skin conditions. No evidence shows it is a cure, but it alleviates the pain associated with tightness and itching. Shea butter can be an ingredient of organic broth. Shea butter is sometimes used as a base for medicinal ointments. Some of the isolated chemical constituents are reported to have anti-inflammatory, emollient, and humectant properties. Shea butter has been used as a sunblocking lotion and has a limited capacity to absorb ultraviolet radiation. ↑ Alfred Thomas (2002). "Fats and Fatty Oils". Ullmann's Encyclopedia of Industrial Chemistry. Weinheim: Wiley-VCH. doi:10.1002/14356007.a10_173. ↑ National Research Council. Lost Crops of Africa: Volume II: Vegetables (2006). ISBN 978-0-309-10333-6. 1 2 E. T. Masters, J. A. Yidana and P. N. Lovett. "Reinforcing sound management through trade: shea tree products in Africa". ↑ Fold, N. 2000. "A matter of good taste? Quality and the construction of standards for chocolate in the European Union. Cahiers d'Economie et Sociologie Rurales, 55/56: 92–110" (PDF). ↑ "Reference.com Dictionary Entry". Retrieved 25 August 2012. 1 2 Goreja, W. G. (2004). "Chapter 2". Shea Butter: The Nourishing Properties of Africa's Best-Kept Natural Beauty Secret. TNC International. p. 5. ISBN 9780974296258. ↑ "Shea Butter". Retrieved March 7, 2013. ↑ "Ori Shea Butter". Retrieved March 7, 2013. ↑ Brenda Chalfin (January 2004). Shea Butter Republic: State Power, Global Markets, and the Making of an Indigenous Commodity. Psychology Press. p. 9. ISBN 978-0-415-94461-8. ↑ Yézouma Coulibaly, Stéphane Ouédraogo & Nathalie Niculescu. "Experimental Study of Shea Butter Extraction Efficiency Using A Centrifugal Process" (PDF). Asian Research Publishing Network. ↑ Hemat, R. A. S. (2003). Principles of Orthomolecularism. Urotext. p. 160. ISBN 9781903737057. ↑ Akihisa, T.; Kojima, N.; Kikuchi, T.; Yasukawa, K.; Tokuda, H.; Masters, E. T.; Manosroi, A.; Manosroi, J. (2010). "Anti-inflammatory and chemopreventive effects of triterpene cinnamates and acetates from shea fat". Journal of Oleo Science. 59 (6): 273–80. doi:10.5650/jos.59.273. PMID 20484832. ↑ United States Agency For International Development, October 2006. "Buying and Selling Shea Butter: A Marketing Manual for West Africa" (PDF). ↑ "CLASSIFICATION AND USES OF SHEA BUTTER | Belvyna Global Nigeria Limited". www.belvynaglobal.com. Retrieved 2016-04-21.